So I went to look up the history of this picture after I posted my last blog. Ok, I never understood that song until fifteen minutes ago. I know all the words, and I really like the song, it just has a whole other meaning now. 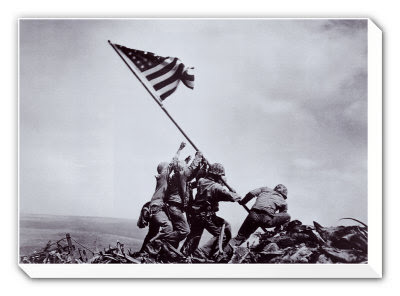 In the picture of the flag raising at Iwo Jima, Ira Hayes is the man to the far left. I realize now that right in the song it says he was one of the men who raised the flag, but I never put it together. The song is basically his biography. After he got out of the war he had PTSD pretty bad, but it wasn't recognized then like it is now. He began drinking heavily and I read somewhere that he was arrested over 50 times for drunkeness. I had no idea he was a real person, I thought it was just a song. He was only 34 when he died. I guess you do learn something new every day.